I had picked out several tops to style these cute shorts, but changed my mind really fast in favor of snapping shots quickly. Best news – no mosquitoes so far this year. I am really lucky, other parts of the county nearer the shore are having a terrible time. 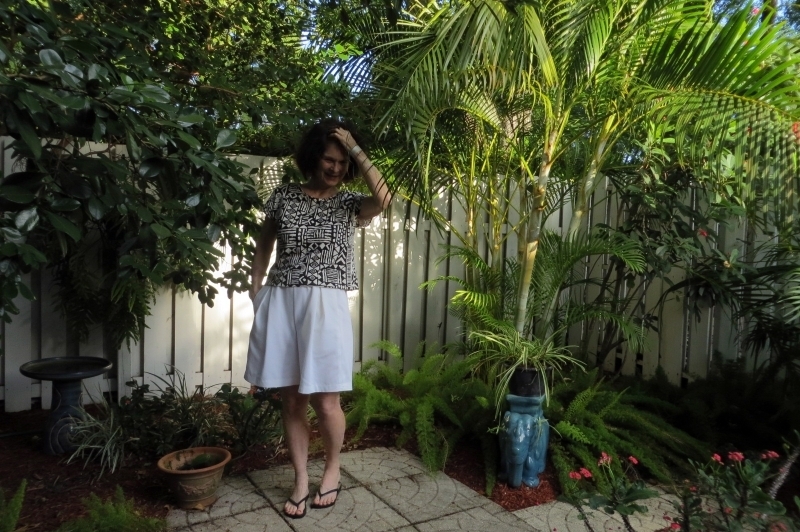 I first saw this Burda Style pattern on Mimi G.’s blog. She’s sewn the peplum front pants several times, they look great on her. 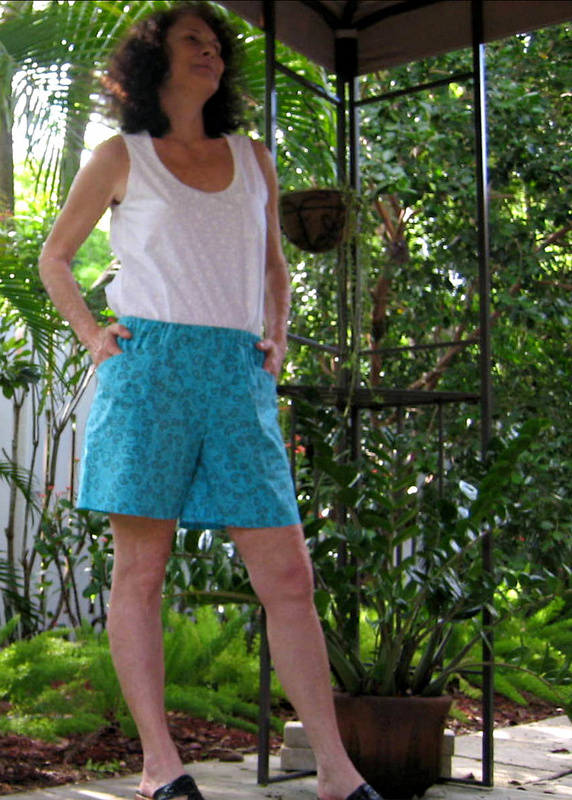 When I looked on Pattern Review, I found Mimi’s review and only one review of the shorts! And that’s it – a web search came up with no other shorts versions. But what a nice pattern. I really like wide leg pants and shorts, so gave this a go. I left off the ties. They are just a bit too much for me. And I also opted out of the cuffs. They never stay rolled! and I do not want to fuss with them. My shorts have an 18 1/2″ outseam. The front styling is so interesting. The side seam is a couple inches forward and has deep in-seam pockets. 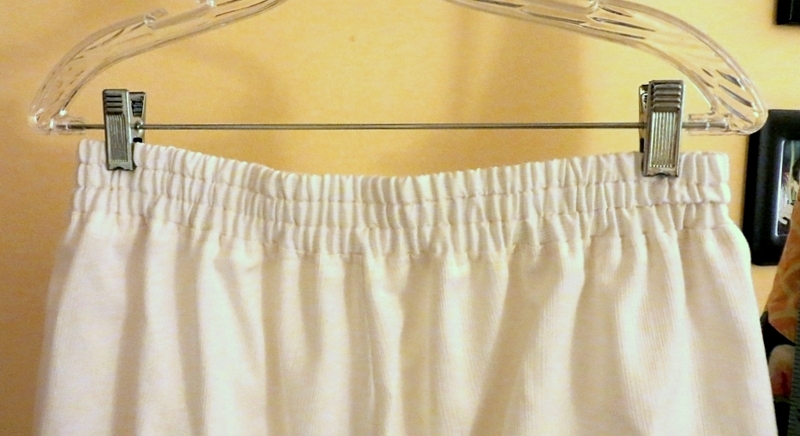 The inverted pleat on each side is echoed in the wide waistband. 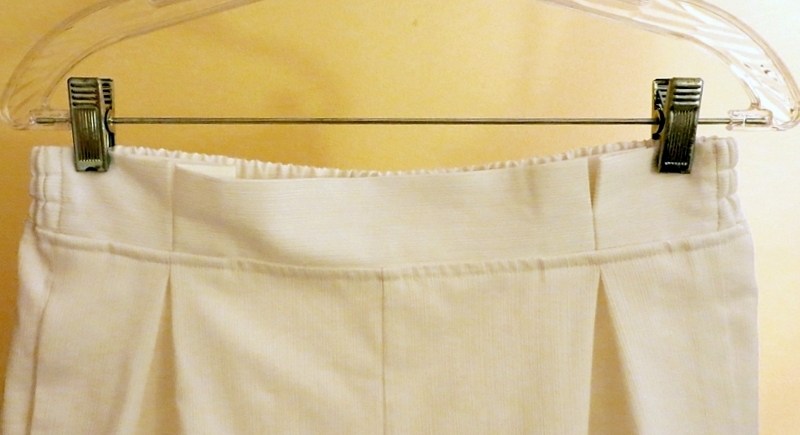 The back waistband has 3 rows of 1/2″ elastic that bracket the flat front. Even though this is a wide leg pant, the gathers at the waist are not outrageous and would look nice with a tucked-in shirt. Overall, very good-looking. But I didn’t care for the front waistband. For one thing, I’ll be wearing all my tops out and over my shorts, and the band pleats are a bit pokey. And for another, without any gathers, darts, or ease in the front, the shorts seemed to pull up at the crotch. Out with the seam ripper, off with the waistband. I attached a simple 1 1/4″ wide band with 1″ elastic. Very comfy, perfect solution. 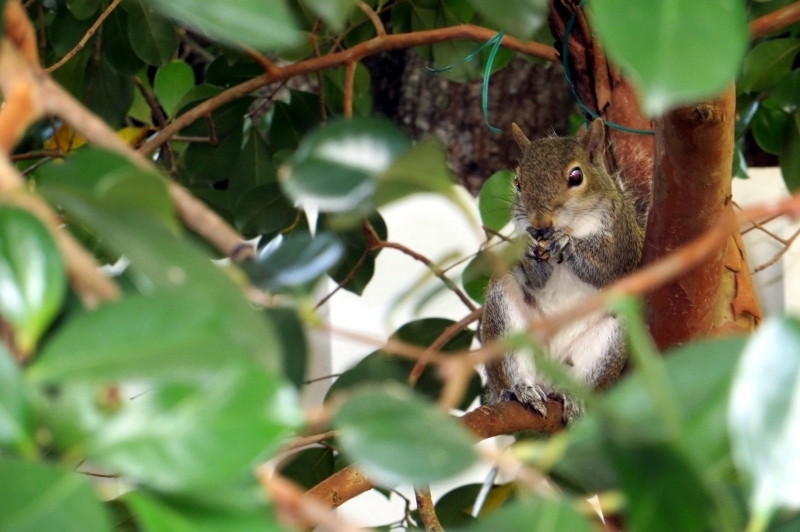 Ms. Squirrel came out for breakfast. 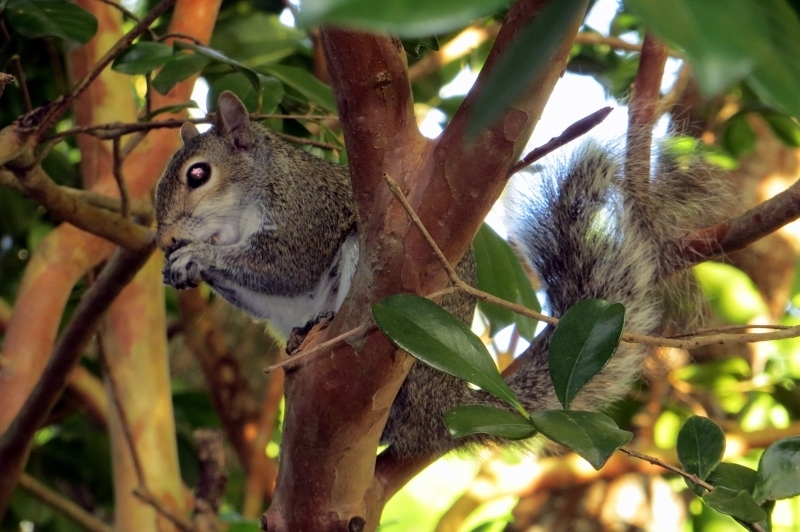 The guava tree is full of fruit, she is so fat and happy. Did that title make you wonder what’s up? These are the cutest shorts I’ve ever seen. And they’re not for me, they’re for my almost-3-year old grand-niece 🙂 I came across the pattern one night at Elegance and Elephants, and just had to get it. I made the size 4 in a mid-weight cotton jersey knit from Fabric Mart. The pattern suggests wovens, but the knit worked fine. 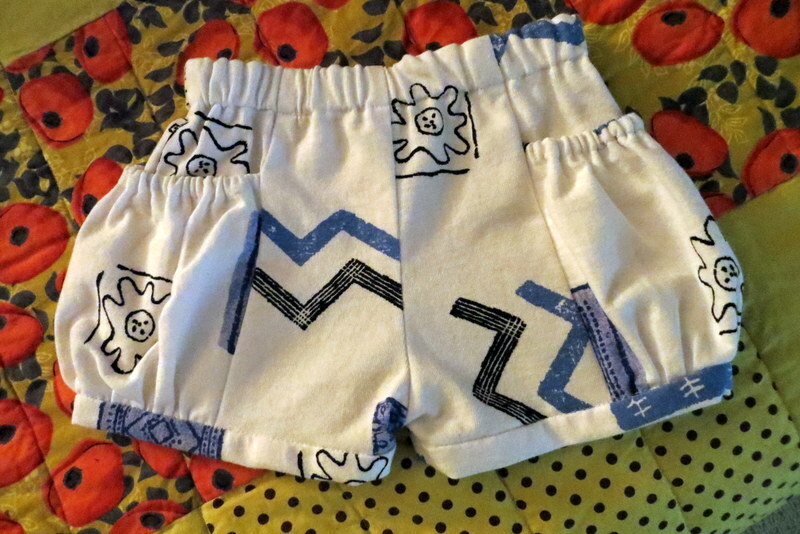 And I like the idea of knit shorts for little ones, so comfy. 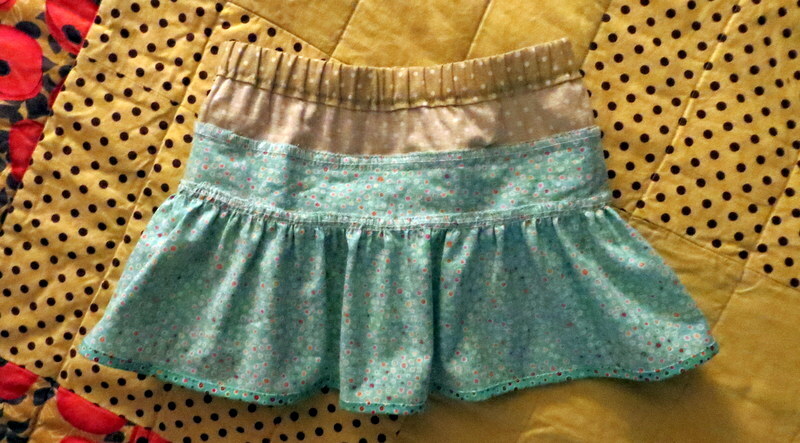 I used 3/4″ elastic in the waistband instead of 1″. Seems more reasonable for such a small garment and body. 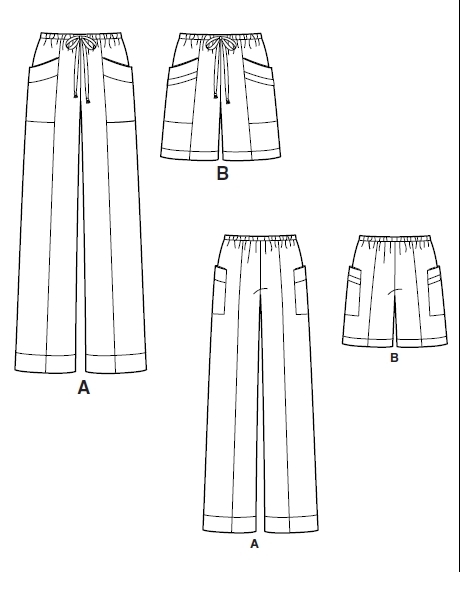 The pattern suggests cutting the waist elastic so that it finishes 1.5″ shorter than the child’s actual waist measurement. 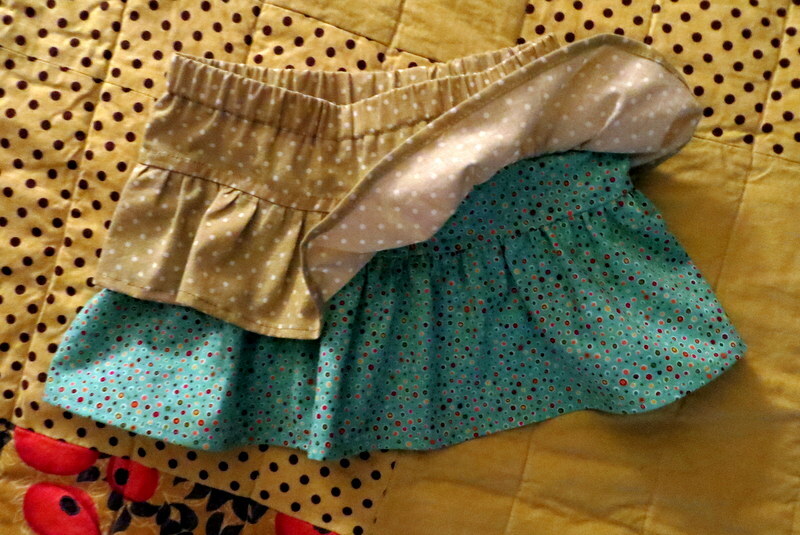 I checked with mom: J.’s waist is 19.5″, but her rtw size 4 shorts have a waist of 20.5″. hmmm. A lightbulb – I found a great resource on the web, childrens size chart. It has everything – all sizes, all kinds of garments, for boys and girls. And it confirmed that the waist on a size 4 is 20.5″. I compromised at 20″. The pattern suggests sewing the cuff on as a band, as one would sew a neckband. However, that would leave a kind of bulky seam on the inside. Instead, I sewed the cuff to the outside, right sides together. Then I folded it to the inside, and stitched in the ditch on the outside along the seam line. The inside is nice and flat and smooth. All the seams are sewn with an elastic stitch, then serged. 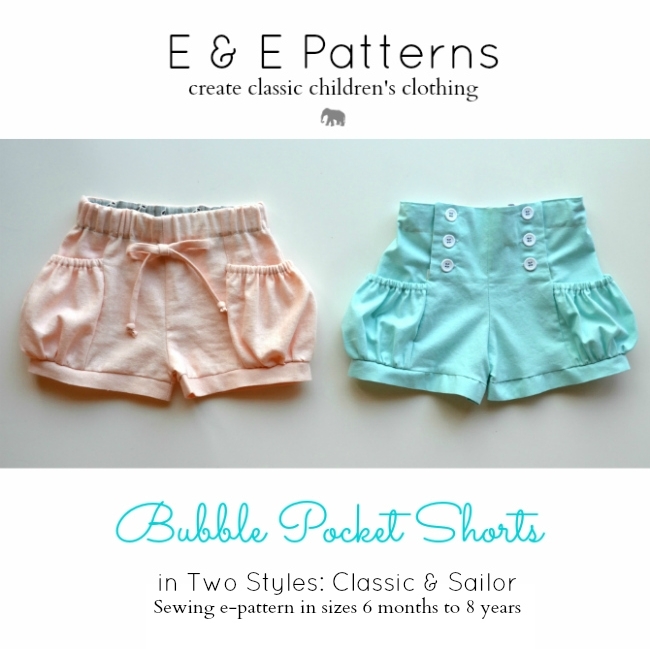 These little shorts will hold up to lots of play! 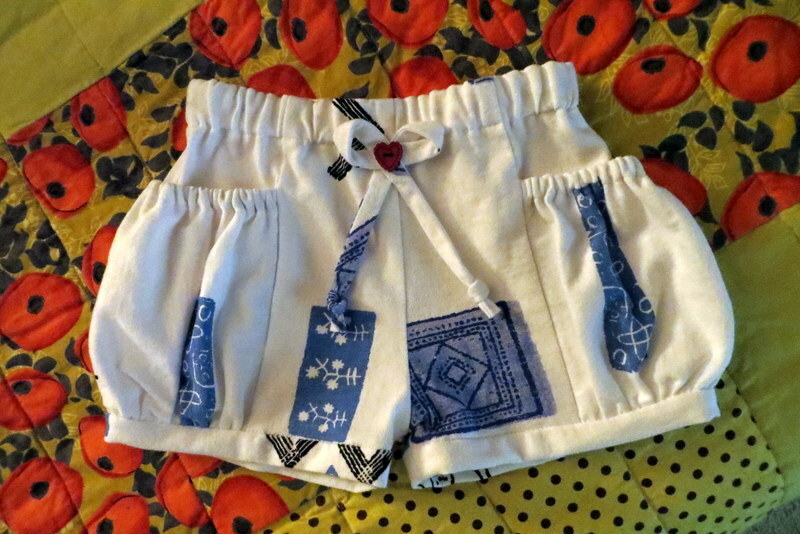 Since I had so much fun with the shorts, I went looking for a little skirt pattern. And look what I found! 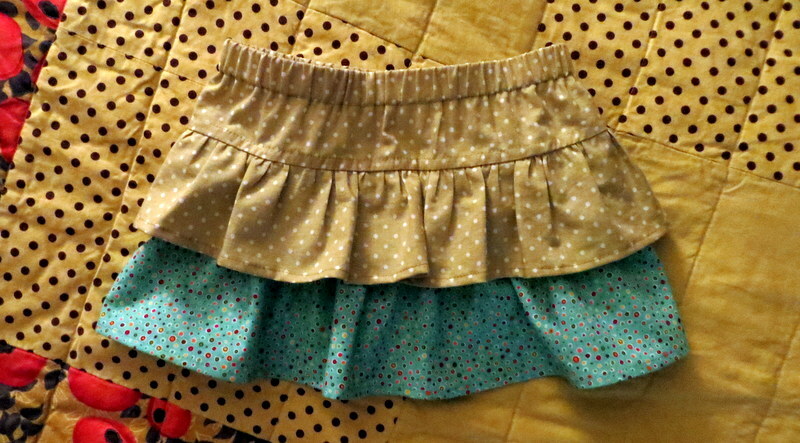 This adorable ruffled skirt is free as an online tutorial from Tanya Whelan at Grand Revival Design. It’s made with four bands of fabric of varying lengths and widths, and is super-easy to cut out and sew. What a nice tutorial – good illustrations and instructions. So cute. I used fabrics I have in the loft, not terribly girly (although the green in the skirt is a pretty lime green, not sage the way it looks here). 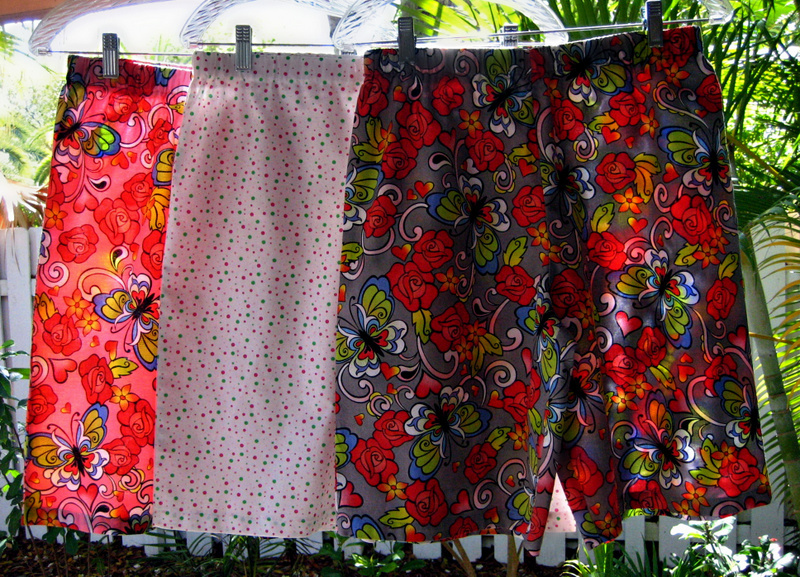 I’ll ask J. what she might like for her next shorts and skirt. Birthday in June! I know I said in my post about pull-on pants that shorts do not suit me…but things change! 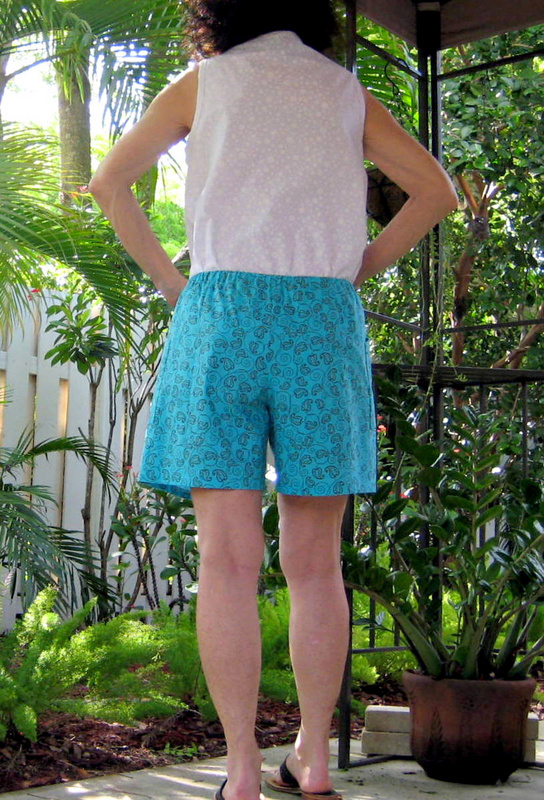 I have decided that shorts suit me very well and am happily making lots of them. 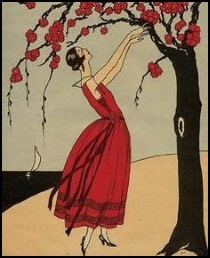 This pattern, Simplicity 1852, is a great find. 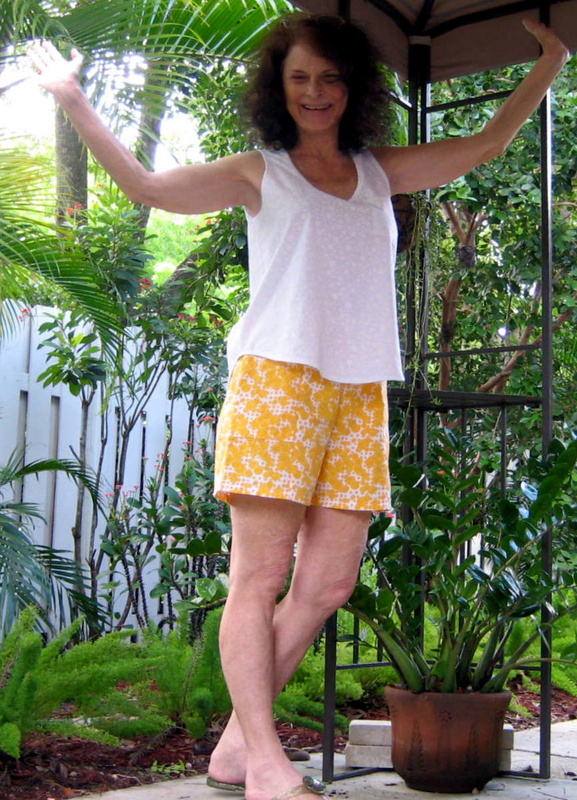 The shorts/pants are described as sitting 1″ below the natural waistline – but I am short in the rise. 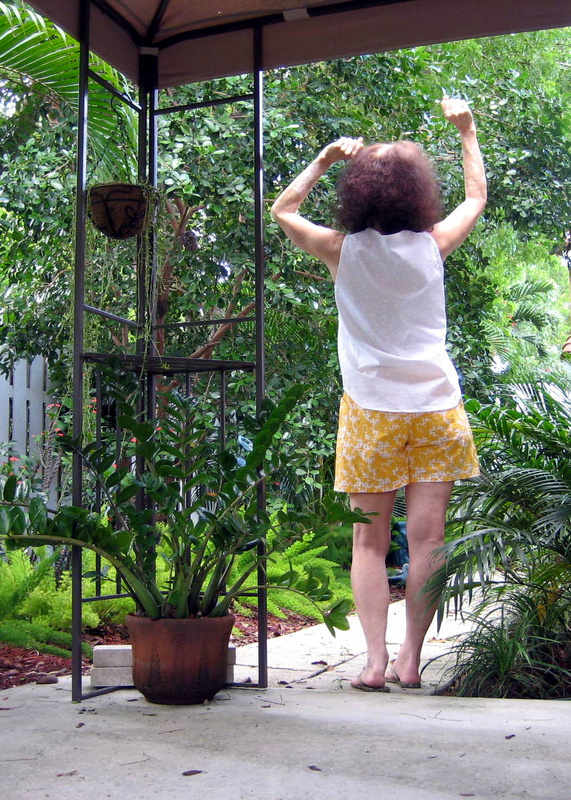 You can see these shorts sit a bit higher on me, as I hoped they would – in fact, they are very comfortably at my waist. It is so nice to have a pattern that fits in the rise. (I have another TNT as well, but it is plain vanilla). 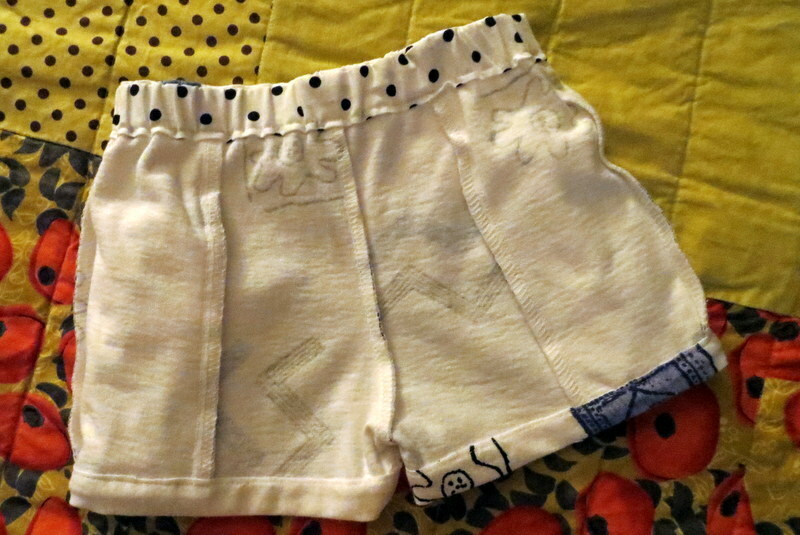 I sewed a M (12-14) and they are so comfy. And….take only a little over a yard to make because of the piecing. 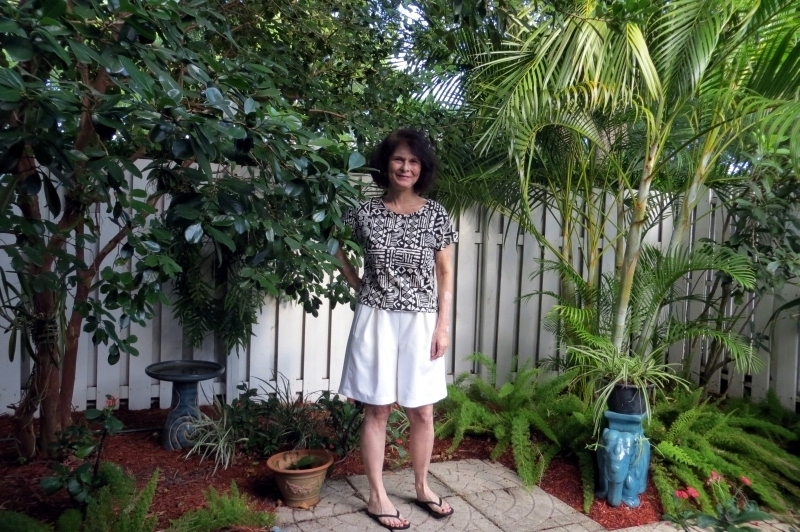 If you modify the pocket just a bit (cut the pocket facing separately), a yard will do it for many sizes! What a great summer stash buster! 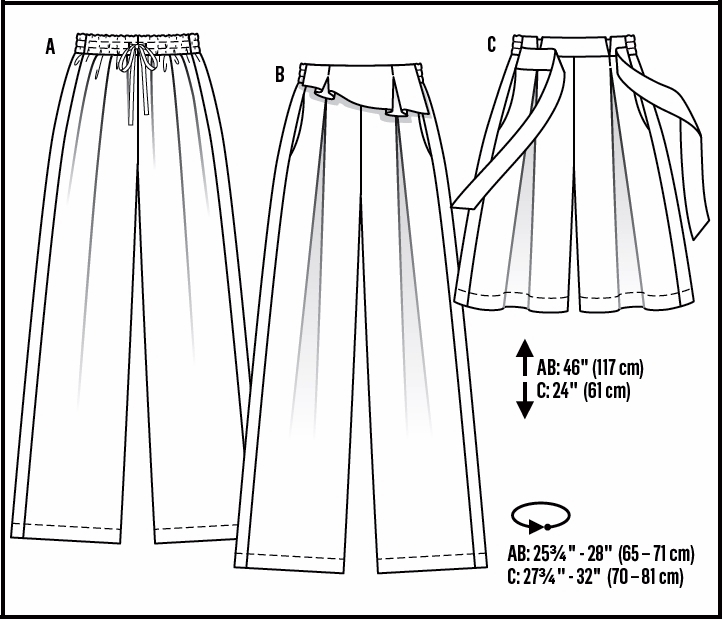 The drawstring is actually faux – it is inserted into two buttonholes set an inch or so apart on the front waistband. Did I bother? Noooo. For myself, I find pants drawstrings distracting, bothersome, and limiting…did I say I don’t like them? I think this is a really nice rear view! 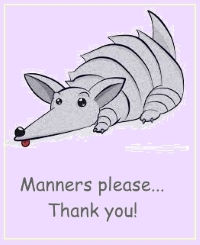 no bag, no sag, pinch, or pleat. Definitely will be making the longer pants version. Then there’s the yellow and white print from ACMoore, the one I used to make my first Wiksten tank top…Oh, what cute shorts they made! Dance time!